You are able to park across the street in front of the Museum after 5pm for free, their also is a Parkade located on Ellis street. La Bussola also has 6 private parking stalls in the back of the restaurant, for these please contact the restaurant at 250-763-3110. Their is a bus station outside to the left of La Bussola. La Bussola has been serving Kelowna since 1974 and is proud to boast the largest wine selection in the Okanagan today. La Bussola is owned and operated by the Coccaro family; Lauretta Coccaro the chef & owner operates the restaurant with her son Luigi Coccaro. The restaurant's menu changes seasonally using local and/or handmade ingredients wherever possible, and includes rotating classic dishes from the original menu from when La Bussola opened 43 years ago. 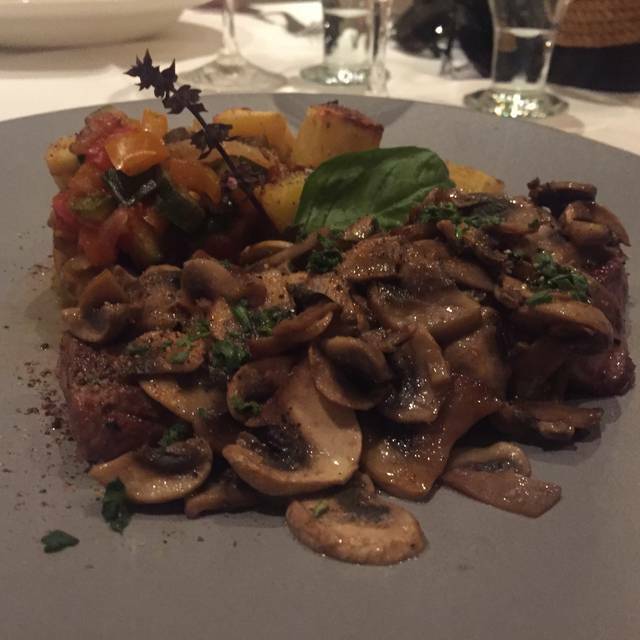 We warmly welcome you to dine with us in our home at La Bussola! I brought my mom for her birthday dinner we sat at 730 and didnt get our food until 930. Our server was nice enough but we sat with empty drinks half of the 2 hours. It was busy but not so busy we couldnt have been taken care of. Good food but bad experience. Probably won't return. 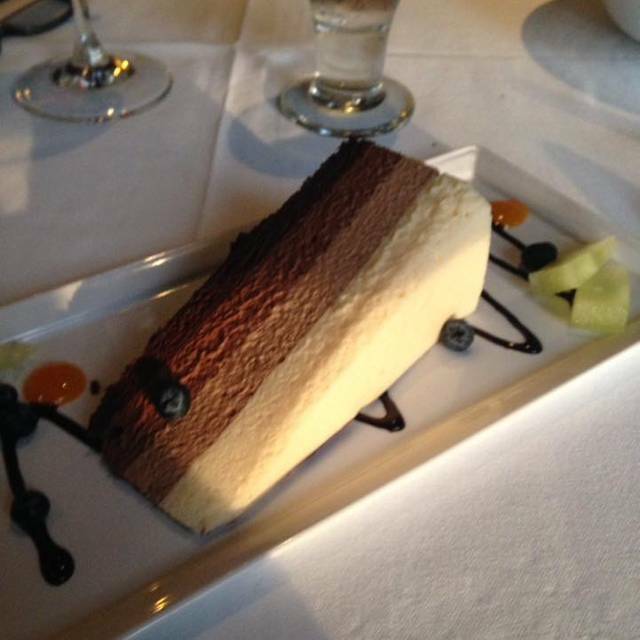 This was our second visit to La Bussola and we especially planned to dine there as we were back in Kelowna for a visit after a year. Our first experience last March was excellent and we were very much looking forward to a wonderful, relaxing evening. However, our waiter was dreadful. Disinterested, almost rude and inattentive. He could not even be bothered to tell us the specials; I had to ask. My guests and I found it very uncomfortable. It should be mentioned the wine waiter was excellent. Such a shame about our waiter though as he ruined it for us; we will not return. We had a lovely evening and a great dinner. The only thing that bothers us that you do not offer an affordable wine on your wine list. Only $50 and up and that makes it at the end a very costly evening out.,The value of the food is really good. Fantastic! Beautifully presented and delicious. Many restaurants in Kelowna are loud and we struggle to hear each other talk over the clatter. La Bussola is the opposite. Peaceful, refined, with tasteful music in the background. Delightful and attentive wait staff. Amazing wine list. Beautifully set tables. The whole house made rolls are delicious. We started with the Scallops - perfectly cooked, Brushetta, and oysters. All were wonderful. Mains we had the Pesto, Lasagna and the daily special. The lasagne noodles were incredibly delicate and tasty. We were too full to even attempt deserts, but they looked amazing. We will absolutely be back. Answer re noise level incorrect, the noise level us perfect, you can actually talk to your table mates without yelling at each other. We love this restaurant for this very fact! Mix up with the bill timing. When you walk in the restaurant, it is a bit confusing because you walk directly into the seating area. The maître d’ station is beyond that. It is uncomfortable and not what I would expect from a restaurant like this. The maître d’ and the service was very good. The problem that we had with the food is that all the pasta dishes include cream. In Italy, dishes and sauces do not have cream unless they are a rose. For example, sage and butterSauce has sage and butter. I Cacio é Pepe pasta has exactly that, cheese and pepper and some pecorino and some pasta water… No cream. It made the pasta is very heavy and very North American. 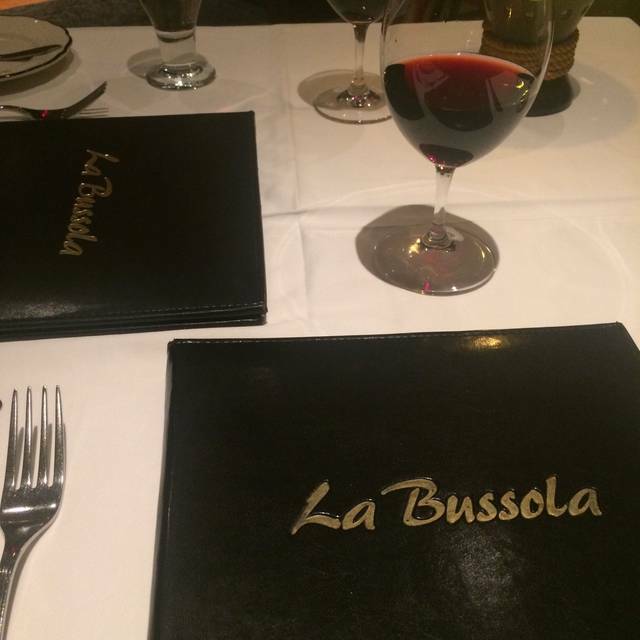 I got back from a trip late and my boyfriend said we were dining at Bussola. I used Open Table and got a table immediately. We arrived as our reservation arrived. We were greeted and seated. The host was bery pleasant and our waiter was fabulous. We had venison carpaccio and it was amazing. I had the variety mushroom ravioli and it was out of this world. My boyfriend had the lamb. He said it was slightly tough but enjoyed it immensely. 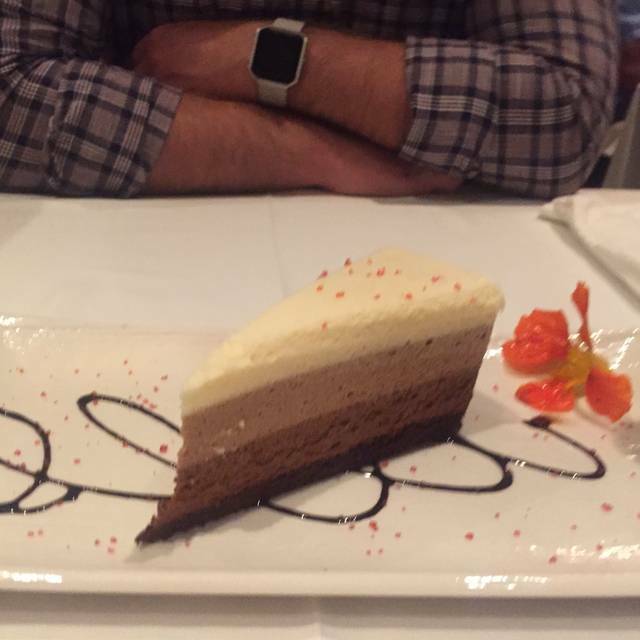 The dessert was the only disappointing thing. It was lemon cheesecake but it didn't taste like lemon. This is our 2nd time there and both times we have enjoyed it immensely. 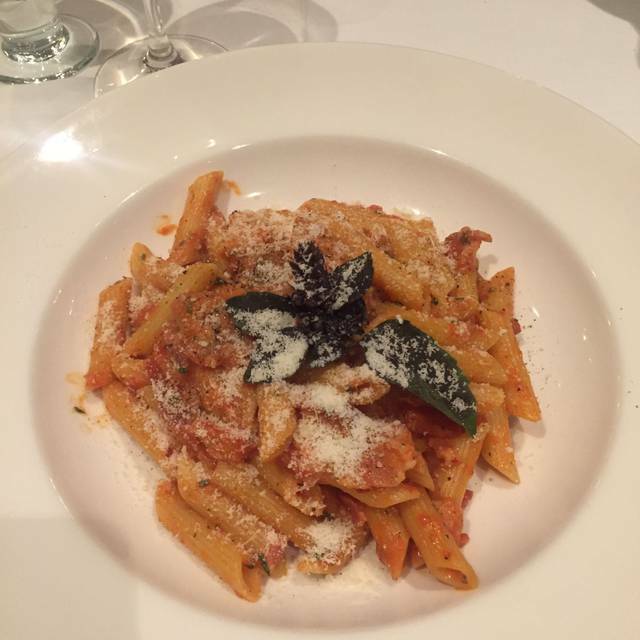 We love Italian food and have eaten in many fine Italian restaurants around the world. This one may just be the best. Simply outstanding in every respcct! You will not go wrong enjoying this fine establishment! The meatball appetizer set the stage. They were excellent. My mother in law had the salmon in which she loved. My daughter had the gnocchi which she said were great but not as good as nonna's (tough standard). 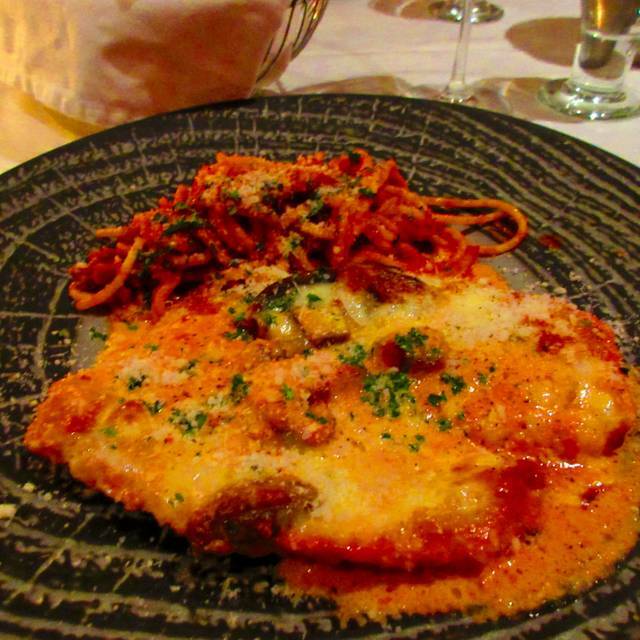 The chicken parmigiana was fantastic with just a light breading. Their in house desserts (gelato and spumoni) topped of the meal. Can't wait to go back. It was not very good due to the incredibly awkward ambience and only slightly above average food. Server was awkward and didn’t seem to know what she was talking about. Great meal, great service, couldn't have been better. Chicken parm was awesome service great !! We ended up being only 4 for dinner instead of the five we had reserved for, but the hostess happily gave us a table for four instead of five - no problem. The table was beautifully set with linens and crystal. The wait staff is very friendly and helpful but not intrusive. We all had the scallops for starters and were all in foodie Heaven while eating them. The best scallops I have ever had. And a wonderful presentation. All of our entrees were also delicious. But I just can't stop thinking about those scallops! It is a lovely restaurant with a great staff and wonderful food. Our evening at La Busola was very memorable. The service was superb. Thank you to all the staff! Amazing food and service. We will definitely be back! Always a wonderful experience! enjoyed the food - ambience- service! I always recommend this restaurant. Valentines day had a special feel and a full house with everyone enjoying themselves! A wonderful family business that has provided all of us so many special times. Absolutely fabulous service even though it was Valentine’s Day and very busy. Food was outstanding! Will definitely come back! Good atmosphere, extensive wine list, a good menu with something for everyone, great service and best of all, it's not loud. You can have a conversation without having to yell. This is one of our favourite restaurants. Always a great meal and experience! Delightful evening with friends that included great food and wine. Our server was excellent and the food was amazing. Recommend this place for a nice meal in a comfortable, elegant atmosphere. Service was decent but the food wasn't anything special. The basic dishes are affordable but the taste from both our meals were disappointing. It's past it's hay day as a fine dining establishment sadly. Great ambience, authentic Italian cuisine, family owned and run. Best Italian restaurant in Kelowna, bar none. Showed up a few minutes early for our reservation and given attitude from the hostess. Wasn’t drinking alcohol that night so seemed as though we were put on the back burner. Ordered the rack of lamb only to find shards of tinfoil in my meal, girlfriend ordered a rare rib eye and it came out well done, sent both meals back and when I got the lamb back the meal was nothing like the first one, potatoes were rock solid and it didn’t have the same presentation or taste. They didn’t charge for the steak as she changed it up for a different meal, and took a slight discount off the bill of $11. Wasn’t worth the wait, our NYE experience wasn’t what we had anticipated. Won’t be going back that’s for sure. It was exceptional!! Amazing Food and awesome service!! Went for my sister’s 65th Birthday. It was a wonderful choice!! Wine very good but pricey, food was very good and the salted caramel gelato was amazing!! Wonderful music, great dining experience. Would highly recommend this restaurant!! This is a boring report. We go there because the food is excellent, the service is terrific, the menu has great choices, the place is spread out enough, so it is not noisy and we can talk easily. It is by far our favourite place to eat. Every time is the same report. Sorry if it is boring.